Our three cats used to share the back yard with chickens. The chickens had "cleaned up" the back yard by consuming all the nice green grass the cats love to chew on. The front yard was not normally accessible to the cats or the chickens so there is plenty of green grass. We decided to build a protected caged-in area which could be accessed from the back yard, through a kitty door in the fence. 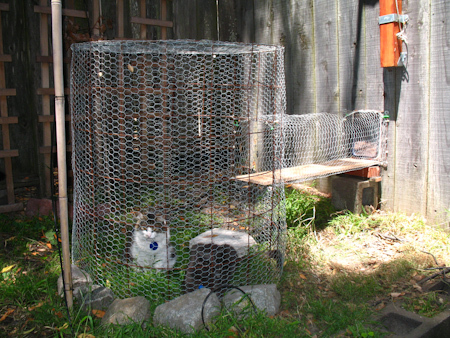 The "Kitty Kafe" is made from a 32" cylinder of 6" mesh 16-gauge wire wrapped with 1" chicken wire mesh, sunk into the ground and weighted down with medium-sized rocks. The access ramp is a piece of plywood surround by a shield of chicken wire mesh. Kafe will be a chicken-free zone. 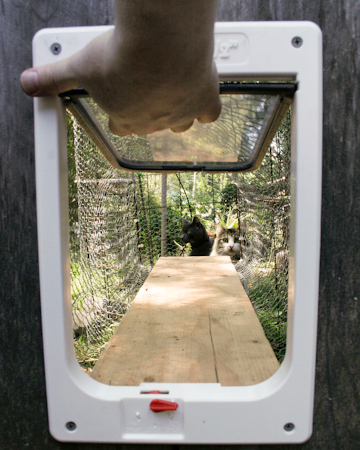 I believe these exist for dogs. Not sure about cats. You can also consider having a water bowl with fresh clean water available all the time.